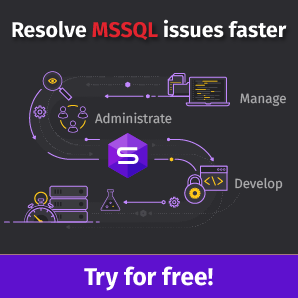 TempDB is a system database in Microsoft SQL Server used as a store of internal objects, row versions, work tables, temporary tables, and indexes. TempDB is available for use to all participants connected to a SQL Server instance (it is a global resource). For those familiar with other database flavors, the tempDB database is similar to the TEMP tablespace in Oracle. To put it mildly, anything that cannot fit your instance memory spills over to the tempdb data files. Temporary tables are created with the # naming convention. I have seen one or two applications in my shop that create a whole lot of these conventions. As a result, it may affect performance. For each temporary table, TempDB distributes pages whose size depends on the table size. In addition, there may be some conflicts if several concurrent sessions are creating such TempTables simultaneously. The READ_COMMITTED_SNAPSHOT isolation level is enabled. We had to do this on two of our instances a few years ago because there were two applications that were experiencing a serious number of deadlocks. Using the snapshot isolation levels is one way to deal with deadlocks particularly if you do not want to go back and forth with developers on proper coding. You should be aware that this is expected to help improve performance. However, it uses optimistic concurrency control which may not be desirable in all cases with respect to data integrity. Indexes are built or rebuilt with the SORT_IN_TEMPDB=ON option. It tends to remove the burden of sorting from the database which owns the index while the rebuilding process is ongoing. It may help to examine the total impact of this option on the instance performance as a whole. The Multiple Active Result Sets (MARS) functionality is enabled. No, MARS is not a planet in this scenario, it is a feature that allows an application to submit several batches via a single connection. It is disabled by default and can be explicitly enabled by including MultipleActiveResultSets=True into a connection string. Internally, SQL Server also used TempDB to create work tables which are commonly used in cursor operations – calls by the GROUP BY, ORDER BY, or UNION clauses. Work tables can be thought of as temporary tables created by the SQL Server engine activity rather than by a user activity directly. 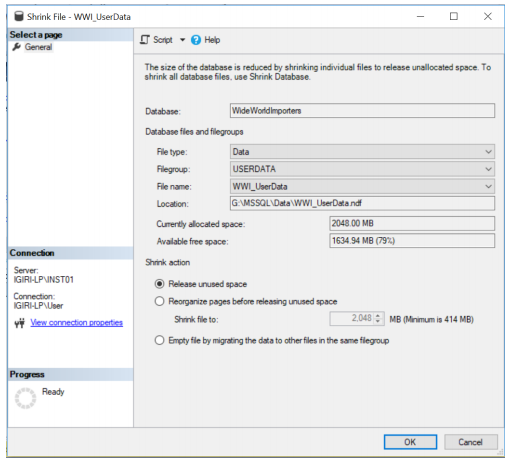 sys.dm_db_file_space_usage: This DMV returns some information about the space usage of files in the databases you are interested in. It can be used to examine any database in the instance and the output pertains only to that database. In the context of this article, we shall be using the DMV to examine TempDB. sys.dm_db_session_space_usage: This DMV is exclusive to the TempDB database and returns the number of pages allocated and deallocated by each session for a given database. The page allocations are typically maintained till the session is terminated. sys.dm_db_task_space_usage: This DMV is also exclusive to the TempDB database and provides some information about the number of pages allocated and deallocated by each task for a given database. sys.dm_tran_active_snapshot_database_transactions: This DMV returns the active transactions that generate and may access row versions. This view is relevant when options such as ALLOW_SNAPSHOT_ISOLATION and READ_COMMITTED_SNAPSHOT are enabled. sys.dm_tran_version_store: This DMV provides some information about all version records in the version store. In an active production server, the records in this table could grow significantly. Thus, we need to be careful when querying the DMV. We can obtain some descriptions of these DMVs from Microsoft documentation. Table 1 shows the description of sys.dm_file_space_usage. The query in Listing 1 displays the file space usage for TempDB and the WideWorldImporters databases respectively. Pictures 1 and 2 return the outputs of this query with both TempDB and the WideWorldImporters databases respectively. file_id maps to file_id in sys.dm_io_virtual_file_stats and to fileid in sys.sysfiles. filegroup_id smallint A Applies to: SQL Server 2012 (11.x) through SQL Server 2017.
total_page_count bigint Applies to: SQL Server 2012 (11.x) through SQL Server 2017. Total number of pages in the file. allocated_extent_page_count bigint Applies to: SQL Server 2012 (11.x) through SQL Server 2017. Total number of pages in the allocated extents in the file. unallocated_extent_page_count bigint Total number of pages in the unallocated extents in the file. Unused pages in allocated extents are not included. store. Version store pages are never allocated from mixed extents. You can use the total_pages column in the sys.allocation_units catalogview to return the reserved page count of each allocation unit in the userobject. However, note that the total_pages column includes IAM pages. the file. Unused pages from an allocated extent are included in the count. page count of each internal object. objects. This count does include all the IAM pages in the file. The unique numeric id associated with the distribution. Note that the total_page_count column shows the exact size of the database file in question. In addition, the LOG and FILESTREAM file types are not displayed. Also, as expected, allocated_extent_page_count matches the used space in the WWI_UserData data file. Table 2 shows the usage of the sys.dm_db_session_space_usage DMV. Listing 2 is the output of the query. Note that the number of rows returned matches the current number of sessions (active or inactive) in the instance. Also, recall that this DMV pertains ONLY to TempDB. session_id maps to session_id in sys.dm_exec_sessions. user objects by this session. internal objects by this session. and SQL Server 2014 (12.x). Table 3 shows the implementation of the sys.dm_db_task_space_usage DMV. Listing 3 displays its output. request_id int Request ID within the session. queries. A session may have multiple requests active at the same time. exec_context_id int Execution context ID of the task. For more information, see sys.dm_os_tasks (Transact-SQL). user_objects_alloc_page_count bigint Number of pages reserved or allocated for user objects by this task. The other two DMVs seem to be empty before any database activity is executed. Tables 4 and 5 show a description of both tables. In the next section, we will take a look at how data in the DMVs changes when we generate database activity. ID is primarily used to identify the transaction in locking operations. stops). For active transactions, the value is NULL. transactions, this column shows 0.
database_id int Database ID of the versioned record. rowset_id bigint Rowset ID of the record. min_length_in_bytes smallint Minimum length of the record in bytes. record_length_first_part_in_bytes smallint Length of the first part of the versioned record in bytes. record_image_first_part varbinary(8000) Binary image of the first part of version record. record_length_second_part_in_bytes smallint Length of the second part of version record in bytes. record_image_second_part varbinary(8000) Binary image of the second part of the version record. To do this, run the simple queries in listing 4. As you can see, there are no significant allocations or deallocations from this small query so we raise the bar by creating a temporary table using the script in Listing 5. We now get a significant number of pages allocated and reserved for our active session 62 (see Fig. 8). Also, pay attention to the significant number of allocated extents and reserved pages shown in sys.dm_db_file_space_usage (Fig. 9). When we go ahead and drop the Temptable #Invoice, we see that the pages allocated in TempDB are released as shown in Fig. 12. However, the output of the dm_db_session_space_usage DMV still indicates that some pages are allocated to the session. We see that this is released as soon as we close the session (session ID 62). Next, we open another session and create an index using the queries in Listing 6. 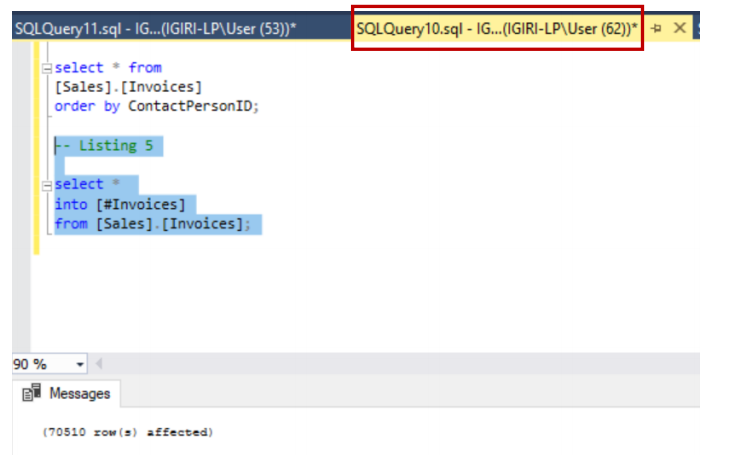 In Query 1 excluding the SORT_IN_TEMPDB option and in Query 2, we use this option after dropping the index. No significant allocations happen for the first case but we see some changes while using SORT_IN_TEMPDB. This change is very slight given the size of the index in question (see Fig. 16 and 17). We shall perform the final test. We find out that till this moment the DMVs such as sys.dm_tran_active_snapshot_database_transactions and sys.dm_tran_version_store return no rows when queried. Let’s enable the SNAPSHOT_ISOLATION and the READ_COMMITTED_SNAPSHOT isolation levels (Listing 7). Once done, a single update statement creates a record in the sys.dm_tran_version_store DMV. Putting this same query is a transaction we use to see that a record is also generated in the sys.dm_tran_active_snapshot_database_transactions during the transaction. We have briefly explored that we can monitor TempDB activity using five key DMVs exposed by SQL Server. When using this level of the monitoring process in a production environment, we can determine whether we need more space in TempDB and data files. Also, we can analyze the impact of the SNAPSHOT isolation if we have enabled this feature before. The output data of these DMVs could also be helpful in clearly showing application developers the impact of their code behavior on tempDB and the instance as a whole. Overall, it is quite rewarding to understand the use of these DMVs as a DBA concerned with performance and space management.